In the series of C tutorial we learned some basic of C programming language, configured C compiler and learned to compile and execute C program. Since the compilation and execution of first C program, I must answer few questions before moving ahead. Questions such as - what is meant by compilation, what happens during compilation, how a simple plain text file gets converted to executable binary file. In this post I will take a deep dive into the C compilation process. So let's begin. What is meant by Compilation? The process of translating source code written in high level to low level machine code is called as Compilation. The compilation is done by a special software known as compiler. The compiler checks source code for any syntactical or structural errors and generates object code with extension .obj (in Windows) or .o (in Linux) if source code is error free. The entire C compilation is broken to four stages. The below image describes the entire C compilation process. To take a deep dive inside the C compilation process let’s compile a C program. Write or copy below C program and save it as compilation.c. To compile the above program open command prompt and hit below command. The -save-temps option will preserve and save all temporary files created during the C compilation. It will generate four files in the same directory namely. Now lets look into these files and learn about different stages of compilation. The C compilation begins with pre-processing of source file. Pre-processor is a small software that accepts C source file and performs below tasks. Remove comments from the source code. Expansion of included header files. After pre-processing it generates a temporary file with .i extension. Since, it inserts contents of header files to our source code file. Pre-processor generated file is larger than the original source file. To view contents of the pre-processed file open <file-name>.i in your favourite text editor. As in our case below is an extract of compilation.i file. You can notice that the statement #include <stdio.h> is replaced by its contents. Comment before the #include line is also trimmed. In next phase of C compilation the compiler comes in action. It accepts temporary pre-processed <file-name>.i file generated by the pre-processor and performs following tasks. Check C program for syntax errors. Translate the file into intermediate code i.e. in assembly language. Optionally optimize the translated code for better performance. After compiling it generates an intermediate code in assembly language as <file-name.s> file. It is assembly version of our source code. Let us look into compilation.s file. Moving on to the next phase of compilation. 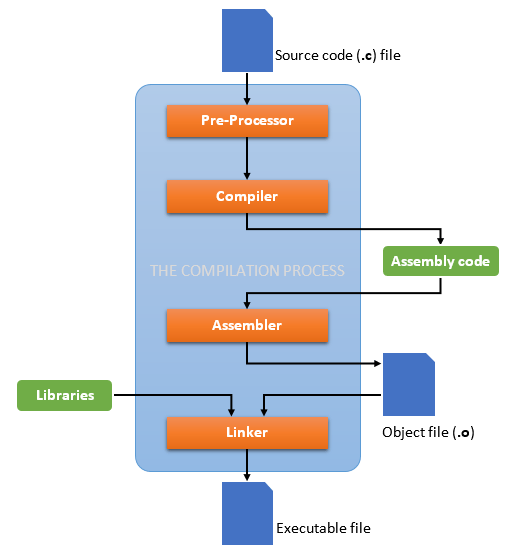 Assembler accepts the compiled source code (compilation.s) and translates to low level machine code. After successful assembling it generates <file-name.o> (in Linux) or <file-name.obj> (in Windows) file known as object file. In our case it generates the compilation.o file. This file is encoded in low level machine language and cannot be viewed using text editors. However, if you still open this in notepad, it look like. Finally, the linker comes in action and performs the final task of compilation process. It accepts the intermediate file <file-name.o> generated by the assembler. It links all the function calls with their original definition. Which means the function printf() gets linked to its original definition. Linker generates the final executable file (.exe in windows). Huuhh, these all happens in a blink by a software known as gcc.